The Mirus chair boasts the ingeniously simple single lever control which operates the three most frequently used chair functions – seat height, seat depth and back tilt can all be operated from a single point of contact. The design concept of the Mirus chair also incorporates a multi-directional interactive neck roll which can help to relax tired neck and shoulder muscles. The 3-dimensional automatic flexible lumbar support system provides full support to the lumbar region with interactive and dynamic movement, intuitively adjusting to your needs. A “zero pressure” seat cushion helps to distribute weight evenly across the seat pad to provide maximum comfort and support. 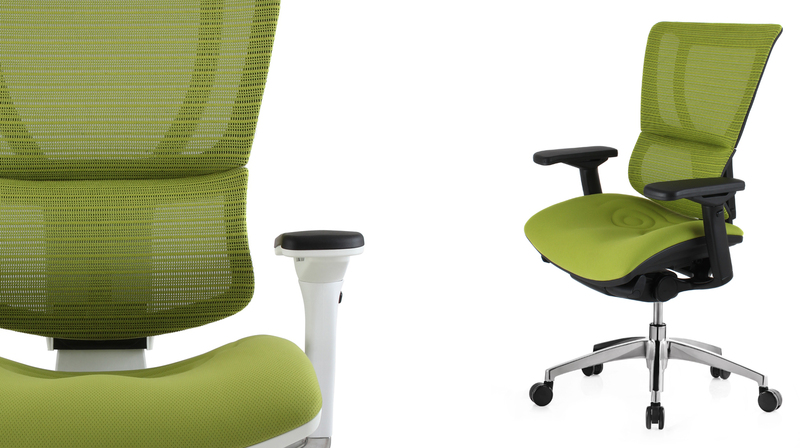 The Mirus chair is 98% recyclable, has Greenguard Indoor Air Quality Certification and meets EN 1335-2:2009 and EN 1335-3:2009. Available in a choice of white and aluminium frame, black and aluminium frame or all-black frame with a mesh back and fabric seat, the colour combinations are contemporary and exciting.